Today is National Tooth Fairy Day in the U.S. Who knew there was such a thing? Everyone growing up as a child has heard of the mysterious Tooth Fairy. She was the only reason kids didn't mind loosing teeth! Most kids would place the tooth that had fallen out under their pillow at night, and wake up to find that the Tooth Fairy had taken the tooth and had left money in it's place! In mythology, fairies are always believed to be kind and giving, but the history behind the Tooth Fairy is a very interesting one. In the early days of Tooth Fairy existence, many people believed the fairy was a mouse! 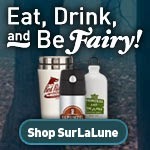 The very beginning myth of the fairy is believed to have started in France, and depicts the fairy in the form of a mouse from the fairytale "Le Bonne Petite Souris ." In the fairytale, the mouse would change into a fairy to help the queen overthrow an evil king by knocking out all his teeth while he sleeps. Doesn't sound like a pretty picture! "Le Bonne Petite Souris" is a tale by Madame D'Aulnoy known in English as "The Good Little Mouse." I have two different translations of it on SurLaLune, here and here. I'm throwing in images of tooth fairy books and films into this post for imagery, but the best book on tooth lore in gernal is Throw Your Tooth on the Roof: Tooth Traditions from Around the World. And who can forget these odd film takes on tooth fairy folklore? Arthur Rackham: A Life with Illustration is a new release with a scheduled official release date of April 1, but my copy arrived on Friday so it is already available. Amazon, for some reason, has the book at 42% off right now and I expect the price to bump back up again any minute. (Ah, the vagaries of Amazon pricing is a constant mystery to me.) So I wanted to post it now in case any of you want to benefit from the great price. Examining the work of the illustrator Arthur Rackham, this monograph traces his achievements throughout his illustrious career. Rackham's illustrations for such works as Alice in Wonderland, A Midsummer Night's Dream, Peter Pan in Kensington Gardens, and Rip Van Winkle have attained the classic status of the writings themselves—and indeed, in some cases, they have become synonymous with them. His works were also included in numerous exhibitions in his lifetime, including one at the Louvre in Paris in 1914. Rackham himself, however, has previously remained a shadowy figure. As well as featuring exquisite illustrations and sketches, extracts from Rackham's correspondence and insightful commentary shed new light on this much-collected illustrator. This is a beautiful book. It is not a brand new book, it was originally published in 1990 but was out-of-print and became an expensive used book. This new edition is a great way for the author to earn the money he has earned by offering such an excellent overview of Rackham's life and work. And this edition is currently priced much lower than used copies of the older edition. Hands down, this edition has some of the best quality reproductions of Rackham's work since the original publications of Rackham's work, perhaps even better than some of those. They certainly aren't yellowed with age! They are crisp, not muddy, and even more stunning as a result. A bonus is that the "usual suspects" are not as common here but the book offers many of the lesser distributed, seldom reproduced illustrations, in other words, ones you haven't seen everywhere before. If you own as much Rackham as I do, this book is still a treasure. If you own none or a little, this is an excellent way to start. Hamilton also shares compelling insights into Rackham's life and work. For being so well recognized in his art, Rackham's life wasn't as well understood until this book was originally published. There's also interesting rather unusual appendices such as "The Business of Illustration and How Rackham Made It Pay" and "Arthur Rackham's Pattern of Earnings." Fascinating stuff. He was more than a genius at art, he was a successful businessman. Now obviously the book is not about fairy tales as much as illustration and Rackham's personal life but Rackham's contribution to fairy tale illustration as well as his influence on future illustrators in the genre is immeasurable. He's almost a cliche but not really since he is so brilliant. I had to use his work for the blog's design so if you visit the blog site proper, instead of through feeds or Facebook, you see his "Old Woman in the Wood" everyday. I'm thrilled with the book and glad I finally own a copy. Alas, most good things must come to an end and a week ago Katherine posted the final Fairytale Reflections, ending fittingly enough with her own: Fairytale Reflections (21) Katherine Langrish. For now, she is going to be changing the focus of SMoST to a book tour and other activities, such as promoting her new book, West of the Moon (it's officially released only in the UK so far, so here's the link). Fairytale Reflections has been a wonderful series and I am sad to see it end for now. Katherine and all the contributing authors were generous with their time and thoughts. It’s hardly a well known story. I found it because of my habit of picking up shabby-looking books in second hand bookshops: a lovely old book called ‘West Irish Folk-Tales and Romances’ collected and translated by William Larminie (‘with introduction and notes, and appendix containing specimens of the Gaelic originals phonetically spelt.’) It was published by the Camden Library in 1893. As always, much more to click through and read so do so! Also, be aware that Katherine posted a short follow-up to this post, Fairytale Reflections - The Djachwi revealed... that will add a little what she discussed in the original post. Ellen's first book, ‘Castle of Shadows ’ (2010) is set in an alternate world similar to nineteenth century England, in a city not unlike London. Young Charlie (Charlotte) is the Princess of Quale. Years ago her mother the Queen – a notable scientist – mysteriously vanished. Her eccentric father the King spends all his time building ever more elaborate card-castles. Neglected and hungry, bullied by the housekeeper, Charlie runs wild and scrambles at will over the roofs of the castle, her only friend the gardener’s boy, Toby – until the day when the suavely intelligent Prime Minister, Alistair Windlass, begins to take an interest in her. But is he a true friend, or does he have some other motive for turning Charlie back into an educated, well-dressed, 'proper' princess? Renner sounds like fun, too, having achieved some of those wishlists so many of fantasy lovers us would like to (or have) accomplished just for the sake of doing and knowing, like fencing and weaving. But for the sake of SurLaLune's purpose, I will highlight Renner's wonderful essay, "HELPERS, HEROINES AND HAGS" that appears in the post. Renner discusses what makes a "girly" story and her run-in with a school kid who was reluctant to read what he perceived as a "girly" book. Ah, nothing like a school visit to keep you on your toes. Those kids will come out of the blue with so much. Since this is an issue that has haunted me for years--especially as a librarian--I enjoyed reading her experience with it as an author. SurLaLune gets this issue on occasion, too, when I get requests for fairy tale fiction for boys to read. I even made a list Fairy Tale Books for Boys years ago that I need to update. Never fear, I made a Fairy Tales for Girls and Women, too, although it is less fiction and more anthologies of tales. I read mythology, folk lore and fairy-tales voraciously, yet certain tales felt inappropriate and even irritating long before I was capable of analysing why that might be. They annoyed me in the same way Barbie dolls did. These were the stories featuring passive girls, usually born or destined to become princesses, like Sleeping Beauty or Cinderella. Girls whose physical attractiveness was the sum of their identity; girls who were not so much protagonists as prizes. I yearned for heroines I could identify with and aspire to be like. Girls who DID things. Who underwent hardship and suffering and overcame the odds by use of their own wit or courage. And I found Gerta in Andersen's The Snow Queen and the brave sister in the Grimms tale, The Six Swans. I found Gretel in Hansel and Gretel; Janet in Tam Lin; and the redoubtable, spendidly named Molly Whuppie – the female Jack who bests her giant. Molly may marry and disappear into 'happy-ever-after', but you know she will go on dominating life just the same. I had a more complicated reaction, no doubt because of the darker themes of forced marriage and the bestial interpretation of male sexuality, to tales such as Mossy Coat, The Black Bull of Norroway, and East of the Sun, West of the Moon, but I still admired the courage and cleverness of the heroines. In these tales, a young woman is forced to perform nearly impossible tasks in order to recover a lost fiancé or husband, and sometimes their children. She succeeds with the help of magical advisers and gifts. So do click through to read it all! Another painting for a Saturday. 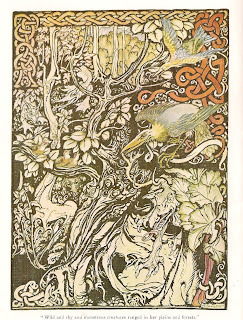 Batten is perhaps best known today for his illustrations for many of Joseph Jacobs collections. He has a gallery on SurLaLune. Found via Children's / Fantasy Illustrations, originally from Birmingham Museums and Arts Gallery. It's Saturday which means it's time for some pretty pictures. 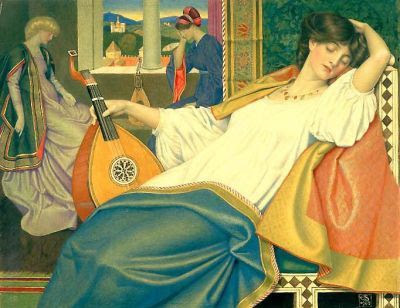 First, we have Sleeping Beauty by Joseph Edward Southall. 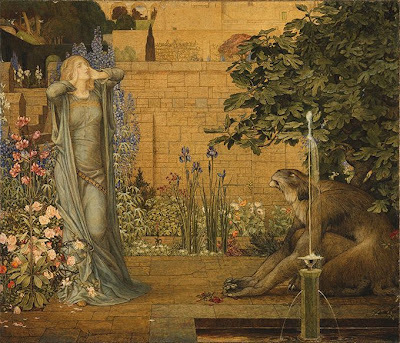 And here's another from Southall who was a contemporary of Walter Crane, this time from Beauty and the Beast. "He was one of the founding members of the Society of Painters in Tempera in 1901 together with Walter Crane and Holman Hunt." 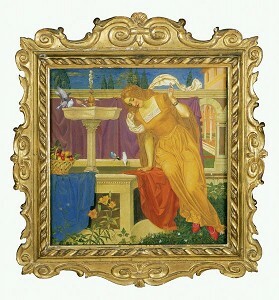 "Beauty Seeing the Image of her Home in the Fountain"
Sleeping Beauty found via Children's / Fantasy Illustrations, originally from Birmingham Museums and Arts Gallery. Beauty and the Beast via Art Fund.